The jubilee year dawned with the publication of the second U. S. edition of the Catechism of the Catholic Church. Regrettably it continues to treat early Genesis accounts in a Tridentine fundamentalist light, completely avoiding any references to modern biblical exegesis or evolution. Its failure to engage today’s religious/scientific culture adequately is an embarrassment both rationally and spiritually. It plays into the hands of “scientific creationists” and has dangerous ramifications for the future of both science and religion. A uniquely American phenomenon, “creation science” is bent upon artificially imposing scientific expectations upon the ancient biblical text. Seventy-five years after the Scopes trial in Tennessee, the conflict between creationists and evolution continues in surprisingly innovative ways. Fundamentalism represents anxiety and religious rage over secularizing trends often inaccurately directed against post-Darwinian science. With its simplistic anti-evolution creed, creationism wages a campaign that must not be ignored. The catechism’s prologue reminds us that “the work is intended primarily for those responsible for catechesis: first of all the bishops, as teachers of the faith and pastors of the Church.” It is to be “an instrument in fulfilling their responsibility of teaching the People of God.” Are our bishops today scientifically equipped to help their flock understand how contemporary theology requires fresh expression in evolutionary terms? Can they stave off the sincere yet misguided attempts of biblical fundamentalists to discount the findings of modern research? Paragraph 390 of the catechism acknowledges vaguely that “the account of the fall in Genesis 3 uses figurative language, but affirms a primeval event, a deed that took place at the beginning of the history of man.” The magisterial authors, in spite of this faint reference to figurative language, reflect a static pre-critical view of Scripture. Furthermore their new glossary and index avoid any mention of evolution. U.S. Catholics often feel they must choose between the idea of evolution and the existence of God. Ours is a time when the Hubble space telescope, fossil research and genetic mapping are continuously providing new information about human origins. It is crucial now more than ever that bishops and their flock have a sense of how these discoveries fit into the deposit of faith. This is a teaching opportunity not to be overlooked. And God has provided the means. When they met in Milwaukee last June, the U.S. bishops approved a project to develop a national adult catechism to be based on the Catechism of the Catholic Church. The writing of national catechisms had been Rome’s intention when the magisterium developed its model, the first since the Council of Trent in 1566. This new U.S. project affords a happy chance to come to terms with the Roman version’s deficiencies. It is a cue for the bishops to join with professionals, men and women scientists and theologians, as they launch this uniquely American tool for Catholic faith formation. In order to offset creeping fundamentalism, it would be helpful for the new U.S. adult catechism to refresh the faithful about our rescue from biblical literalism by Pius XII’s 1943 encyclical letter Divino Afflante Spiritu, which encouraged scholars to study Scripture in a historical and scientifically critical manner. 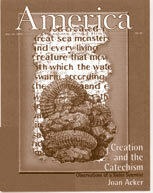 An American catechism could lead by highlighting the Second Vatican Council’s continuing stress on historical critical methods of exegesis in the “Dogmatic Constitution on Divine Revelation.” Reporting John Paul II’s recognition in 1996 that “evolution is more than just a hypothesis” would be an important assurance that evolution is a concept loyal Catholics can safely embrace and study. In fact, the latest theology reveals evolution as magnificently unveiling a biblical God of promise who hides divine power to let creation develop on its own built-in terms. An adult catechism challenging fundamentalism in this way would corroborate the pope’s prefatory letter in the Vatican catechism, declaring that the work “should help to illumine with the light of faith the new situations and problems which had not yet emerged in the past.” At present the magisterial authors seem to be shining the light of faith only backward toward Tridentine interpretations of early Genesis, instead of aiming its beams ahead on discoveries made in scriptural exegesis and science over the subsequent 450 years. A likely concern of our U.S. bishops and their writing collaborators might be that articles 374 to 421 in the catechism on (pre-fallen) “Man in Paradise,” “The Fall” and “Original Sin and Its Consequences” are yesterday’s theology. They are roadblocks to the truth that religious faith and the teaching of evolution can unquestionably coexist and even bring satisfying and enlightening theological perspectives. Adults of the third millennium deserve the evidence gleaned from the intersecting reflections of modern theology and science. It would be useful for a new U.S. adult catechism to reveal that the creation account of Adam and Eve in Genesis does not relate actual historical facts. Its wisdom goes deeper and may be considered an Old Testament parable from an earlier tradition, full of fresh and creative symbols. What did the biblical writers intend to express? Adam is Man, Eve is Woman, God is the potter who formed them from earth’s clay. Yahweh is close to them, walking with them, calling them in a special way to participate in the divine life, giving them a singular likeness to divinity in their free will and intelligence. The Roman catechism teaches (No. 374-415) that an actual first couple, Adam and Eve, were born into a paradise-world without ignorance, pain, disease or death. Those whose Catholic grammar and high school days span the first half of the 20th century remember being taught that our first parents possessed those qualities as “preternatural gifts.” In fact, the Council of Trent condemned anyone who denied this doctrine. The Roman catechism teaches further that the historical Adam and Eve were tested and fell, and by this disobedience changed the nature of the world itself from a paradise without ignorance, suffering or death to its present state as a “vale of tears” in need of redemption. “This entire harmony of original justice, foreseen for man in God’s plan, was lost by the sin of our first parents” (No. 379 and elsewhere). The Vatican catechism further implies that if Adam and Eve had not sinned, there would have been no need for the Word to become flesh and redeem us. “The New Adam makes amends superabundantly for the disobedience of Adam.... Thus the Exultet sings, ‘O happy fault, which gained for us so great a Redeemer!’” (Nos. 411 and 412). Since Augustine’s interpretation of the fall in the fifth century, the magisterium has passed on the doctrine that the human race, as one body of one man, is implicated in Adam’s sin. To date, this is the traditional Catholic doctrine on original sin, based upon a literal, historical approach to Genesis. The Curial concept of original sin needs a contemporary updating. Theologians today characterize this doctrine as rationalized myth about the mystery and reality of evil in the world. Our human efforts to overcome the physical and moral effects of evil cannot be completely fulfilled in this life. God, the creator, knew this and determined from the beginning to send Christ to earth in the fullness of time. Significantly, in 1993 the Pope beatified an early Franciscan theologian, John Duns Scotus, a contemporary of Aquinas, whose thought is just now coming into its own. Duns Scotus saw Christ as the head of creation, the model God had in mind when the human race was formed. Christ’s coming to earth was not an afterthought, a plan B, the consequence of our first parents’ “happy fault.” Duns Scotus echoed Paul’s words to the Colossians (1:15-17): “Christ is firstborn in all creation. Before anything came to be, Christ was.” Already in the 14th century, Duns Scotus had anticipated modern Christology. Our world, in its process of becoming, was programmed from the beginning by the creator to witness a Christogenesis, even if a mythical first couple had never sinned. Because Duns Scotus penetrated the meaning of God as love, he saw Christ’s descent into flesh as the eternal plan of God. The mystery centers on the truth that love has to give of itself, to share and take risks. By emptying himself of the uncreated Godhead, the Word tested the very lengths of love. As a human, Christ verified that earthly evolution is a pilgrim-process involving not only birth and growth, but also the self-transcendence of death. Rejecting the Roman catechism’s preternatural gifts of freedom from ignorance, pain, disease or death, modern theology regards these evidences of finiteness as necessary parts of created life, just as natural as birth. Christ’s incarnation demonstrated that physical death is ultimately to be connected with resurrection into a new and changed eternal life. His crucifixion was the form Christ’s redeeming death took when he surrendered himself in time to the free will of humans. An adult catechism coming to terms with this dynamic theology would quicken the pulse of the faithful. Today’s scientific evidence for evolution is compelling and, though subject to revision in its mechanism (the how), is a generally accurate account of the way life developed on earth. Contemporary geologists, paleontologists and biologists are quite familiar with the geologic time chart embracing 4.6 billion years of earth history. Putting those almost interminable ages on a one-year January-to-December time scale reveals that our human race is only two minutes old. Humans were preceded by at least 3.6 billion years of life, which began with bacterial microorganisms in late March of that scaled-down year. Over time, non-living chemical DNA or RNA fragments wrapped in protein coats, the viruses, learned to live together with bacteria as parasites. Viruses could reproduce only within their living hosts, in a borderline state between life and non-life. For 1.5 billion years, free-living bacteria, some as viral hosts, were the only forms of life on earth. As any antibiotic or antiviral user today can sadly affirm, microbes are eon-experts at mutating in order to escape their own extinction. The evolutionary process of life continued. Simplicity led to complexity, lower levels to emerging higher levels, where the whole of each succeeding hierarchy was greater than the sum of its lower-level parts. Most enlightening is the discovery of 20th-century molecular biologists that the original DNA making up bacterial genes reads the same molecular language as plant, animal and human genes. With slight exceptions, the triplet “words” coded in DNA stand for the same 20 amino acids that build proteins in all living things. Our chemical alphabets and words are identical; the genetic code is universal. This suggests that all living things have a common evolutionary ancestor. Using a biblical image, it is as if there had been no Tower of Babel confusing primeval language in the genetic domain! Biochemistry’s discovery proclaims, not human lordship over all creation, but rather human kinship with it. We humans, two minutes old, do not stand completely apart from the rest of nature that preceded us; rather we are in continuity with it. What else does science tell us about the literal reality of the biblical creation story? The so-named preternatural gifts are creations of a pre-scientific age unaware that genesis was still in process. Today we recognize, as a result of the pioneering research of such scientists as Leeuwenhoek, Pasteur and Fleming, that microorganisms have always been and still are the cause of disease and death in all forms of life. Microorganisms, preceding humans by 3.6 billion years, make the preternatural gifts taught in the Roman catechism historically impossible. Science reinforces theology in recognizing that disease and death have always been part of God’s plan for earthly becoming. Scientists in our computer age have further discovered the mysterious principle that evolution from simple to more complex levels of life cannot proceed without fragility and instability. Life’s capacity to use the waste of lower aging and dying levels as food for the next level is a built-in trait. New life is possible only through the death of the old. Again, death has always been part of the plan! Contemporary theories of chaos and complexity reveal a universe endowed from its conception with a skill for self-organization as higher levels emerge. Nature is open to often surprising experimentation with novelty and indeterminism as it self-organizes. This is a far cry from the scientific determinism of the past. Yes, science, too, has evolved, and with its dynamic new perspectives, has unwittingly compelled change for theology. The Roman Catechism of the Catholic Church closes (Part 4, Section 2) by wisely treating the kingdom of God within the context of the Lord’s Prayer: “Your kingdom come.” We are experiencing in our human era the “already/not yet” time of the kingdom, as understood by the theologian Karl Rahner, S.J. By this he meant that, although the reign of God is not totally present until history ends, we are in the unfolding phase of sacred history that is bringing it about. It is not totally in the future either. Wherever there is active love of others, particularly of the abandoned and destitute, wherever there is acceptance of God’s self-communication in the word, the kingdom is at work being built. Human effort enters into God’s choice of the final coming—when the preternatural gifts of a mythical paradise will be a reality far above anything eyes, ears or mind can conceive. The longed-for preternatural gifts will be ours eternally as supra-natural gifts in the end-time paradise toward which all of us “original sinners” are straining with eager longing. A selfless, loving Christ, Alpha and Omega, will have led us all the way. Sister Joan Acker’s splendid article, “Creationism and the Catechism” (12/16), evoked recollections of the same feeling of disappointment and betrayal I experienced when I first perused the Catechism of the Catholic Church. I would add that creationists have a much bigger problem with the mystery of suffering and evil than Christians who accept evolution. One wonders, for example, how God could create a world in which there are earthquakes, tornadoes and birth defects. But once one realizes that God wills to create this kind of a world, then random events and genetic mutations are not only a distinct possibility but even a necessity. Could God have created a different kind of world? Why not? But then it would be of a different kind of matter than we are made of, and we would not be a part of it. I congratulate Sister Joan Acker, H.M., for her courageous article, “Creationism and the Catechism: Observations of a Sister Scientist” (12/16). If only the American bishops would accept her suggestion for writing the proposed national catechism in collaboration with theologians and scientists. In my 23 years as a parish D.R.E. and an instructor of adults in the diocesan basic theology course, I have encountered many adult Catholics with a fundamentalist understanding of Scripture supported by the static pre-critical view of Scripture in the Catechism of the Catholic Church. When teaching Scripture, I try to help adult students understand that the creation account in Genesis does not relate actual historical facts by showing them a video on evolution from Carl Sagan’s series “Cosmos.” As Catholics, we do not have to dismiss science; we do not have to choose between the idea of evolution and the existence of God. What a great teaching aid this American catechism would be! Sister Joan Acker’s plea (12/16) for an adult catechism that is in harmony with science reflects a broader need to focus on the beautiful underlying messages of parables, metaphors, myths and symbols in our Bible, rather than a literal focus on the stories themselves. Full networking with scientists would be inspiring not only to adults but, more important, to our youth. I’m not one who writes letters to editors, but I want you to know how much I appreciated Sister Joan Acker’s “Creationism and the Catechism” (12/16). I am a housewife and mother and could never play hardball with the intellectual giants who frequent your pages. But I will tell you this: for years I have wrestled with the way the Adam and Eve story has been taught. Deep down inside, I have not been able to accept fully the notion of Eden, preternatural gifts and the Fall. Is life not a process? Does not God fashion us through growth, development and change? I am not so naïve as to be unaware of the tremendous challenges Sister Acker is issuing to the church’s hierarchy. The nature of such challenges leaves no room for complacency of any kind and calls us to grapple with our religious understanding. The task of theology is ever to push the limits of our understanding. The task of reformulating religious language and developing effective methods of catechesis is an ongoing task. What are we afraid of? Are we afraid of exhausting the mystery of God? I ask myself, “Could I have come to accept Christian truths if I was not brought up in the church?” Sadly, I’m not sure and am grateful for having been brought up in the faith. But are we failing the people who hunger to know God? Yes! There is truth to the expression “a leap of faith.” But it is a “leap” that does not require a lobotomy. Sister Joan Acker’s precise and scholarly article, “Creationism and the Catechism” (12/16) is an exceptionally clear presentation of the synthesis between science and theology addressing the questions of creation. It deserves to be the framework for the U.S. bishops’ national adult catechism project. Let us hope that the bishops will read and heed her plea for “collaboration with theologians and believing scientists” as they pursue their project. And let us pray that the bishops will have the courage to resist efforts to return to a simplistic and literal theology of creation that ignores biblical scholarship. Such pressures may come from many segments of today’s church. This is a rich opportunity for the teaching office of the bishops. May they resolutely take their stand. Thank you for Sister Joan Acker’s call for the proposed American catechism to be written in a context of consciousness of the story of the universe as we receive it through science today. Doing theology, reading Scripture and preparing to preach in such a context strengthens the power of the truths we cherish while expanding their meaning to include even more challenging insights for Christian living. But letting go of an ancient, comfortable worldview (even if we hold it only for our religious reflection) involves a process of conversion. Like all conversions, this too demands asceticism and intellectual discipline: suffering the death of some images and premises so that new life full of promise and energy may rise up! The paschal pattern so evident in all parts of creation beckons us to participate freely. Wow. This articles considers science to be more solemn, relevant and infallible than the decrees of Trent, and yet still claims to be Catholic. That's very sad. Jesus is the Truth, and the Holy Spirit leads his Church to all Truth, as the Bible says. "Whatsoever you bind on earth is bound in Heave" "He Who Hears you Hears me". Why do people even call themselves Catholics when they don't believe what the Church teaches? Hardly anything in this article was even worth reading for most people. The Church doesn't get involved with scientific issues, and the fact that nun writer is emphatic about scientific issues betrays something about her kind. They do not truly believe in Divine Truth, but instead prefer science as their god, teaching them how to interprete the "wise traditions of man". Joan Acker needs to read Pascendi by Pius X and start worrying about her spiritual soul, instead of worrying about evolution (as if that valid scientific theory has anything whatsoever to do with getting to Heaven). Why she fears being out of line with scientists, isntead of being out of communion with the Vicar of Christ Himself, I cannot say. Modernism has deep roots, and it is intellectually destructive as well. And this articles use of Duns Scotus was amuzing, considering how this Blessed was an orthodox Catholic, faithful to the Pope of his day. He is known as the "master of subtle proofs", and fuzzy thinking liberals like to try to manipulate his wording; it doesn't scare them as much as Thomas Aquinas or Pope Pius X (both saints from God, enjoying Heavenly bliss as I type). Catholic readers: this article and what it promotes is very dangerous, and frankly, stupid. It flat out says that "ignorance, pain, disease or death" are regarded by "modern theology" as "necessary parts of created life, just as natural as birth". As if God Almighty could not have created created a world ininially without such defects. As if "these evidences of finiteness" are alone proofs of finiteness (Modernists have trouble understand that they themselves are finite, as their Kantian tendencies flowing from their emotional deifications reveal). The Bible clearly teaches that God did not create death, since he is the God of Life. This brand of "modern theology" makes the Bible meaningless; if its plain wording (understood in the sense in which is was written) is not accurate, than it is no more the Word of God than some Indian "holy book", which is really what the American Magazine wants people to think. But God has revealed who the victors will be: faithful Catholics who accept God's word as a trusting child would. Perverters of doctrine will receive another reward (Eph 4:13; 1 Cor 1:10; 2 Cor. 2:17). God bless. Our Lady of Fatima pray for us sinners!! As far as I can tell, Sister Acker’s criticism of the Catechism of the Catholic Church appears to be based on a misunderstanding of it. She accuses the Catechism of purveying “scientific” creationism and rejecting evolution, but the Catechism, in fact, does neither. Sister Acker’s article focuses on the story of Adam and Eve (from Genesis 2 & 3) and repeatedly accuses the Catechism of advocating the historical accuracy of the Genesis story. But in reality the Catechism never mentions Adam or Eve. She repeatedly accuses the Catechism of purveying an unscientific belief in the “preternatural gifts” of the primordial couple. However, the term “preternatural” never appears in the Catechism. While the Catechism does make a vague reference to “our first parents,” it does not mention Adam and Eve by name and it does not advocate the historical accuracy of the Genesis story. Acker’s article attempts to correct the Catechism in a number of ways and fails each time. First she claims that, “The curial concept of original sin needs a contemporary updating.” However she has not explained whether the doctrine of original sin should be changed or abolished. If it is to be changed, what should it be changed into and how should it be phrased or articulated? Acker has not explained this. She makes several claims about the age of the earth and universe, as if to refute a fundamentalist belief in a “young earth,” but the Catechism makes no assertions about the age of the earth. She proposes another correction by claiming that humans, “do not stand completely apart from the rest of nature,” but the Catechism never says that we do. She appears to reject the Catechism because it does not advocate evolution. However several Catholic scientists (who support evolution) have expressed the view that it is not the church’s job to teach science or make it doctrine. What the Catechism has done is not a fundamentalist historical reconstruction of the Garden of Eden. But rather, the Catechism, the magisterial church, and the New Testament have given us the doctrine of “original sin,” which is a theological interpretation of the Genesis story. The story does not have to be historically precise to serve as a scriptural basis of doctrine. And it is an important and well-founded doctrine. joan, thank you so much for this article. i feel exactly as you do about creationism . it seems you read my mind,but i couldn't have explained it as eloquently as you did. This article also appeared in print, under the headline "Creationism and the Catechism," in the December 16, 2000 issue. Joan Acker, H.M., is a Humility of Mary sister who has just completed 50 years as an educator. She and her colleague Ernest Spittler, S.J., received the 1998 John Templeton Foundation Science/Religion course award for their course, "Issues in Science and Religion," at John Carroll Univeristy, Cleveland, Ohio.